Park director Rian Labuschagne says for the first time in years, Zakouma National Park's largest herd stayed inside the park instead of migrating beyond its boundaries. A potential sign the herd has adapted to poaching threats outside the park. 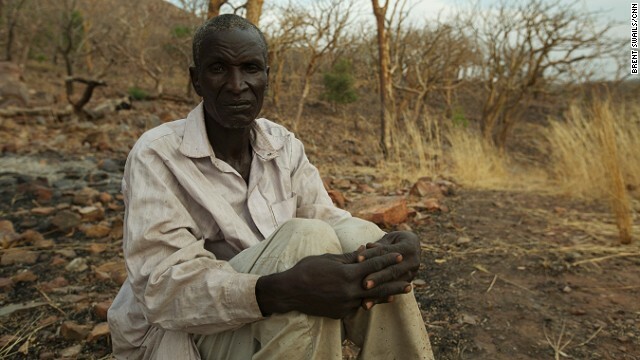 Zakouma's elephant population has been decimated by poaching. In 2002, there were more than 4,000 elephants in the park, today there are just 450. Tracking the elephants on foot usually results in walking well behind in the herd's dust trail. 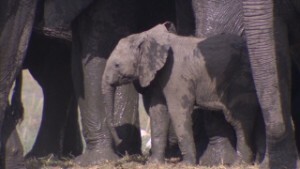 It took the CNN crew several days to get close enough to film Zakouma's new born calves. Nomadic herders prepare a slaughtered goat. 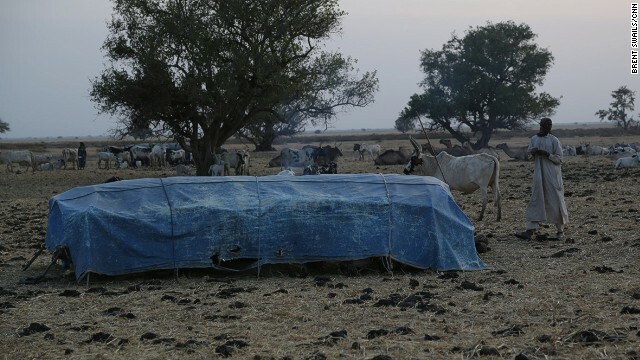 The area surrounding Zakouma is dotted with nomad tents and their livestock. The terrain is rugged, lawless and largely inaccessible by car, making it ideal for poachers. 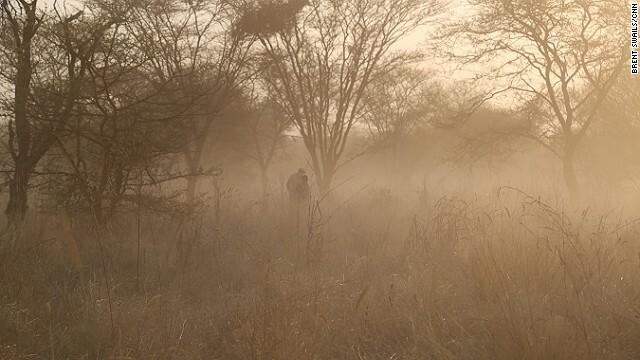 A member of Zakouma's newly formed rapid response team patrols the plains surrounding the park's border. The team was formed by park management to take on an increasingly militarized poaching threat. 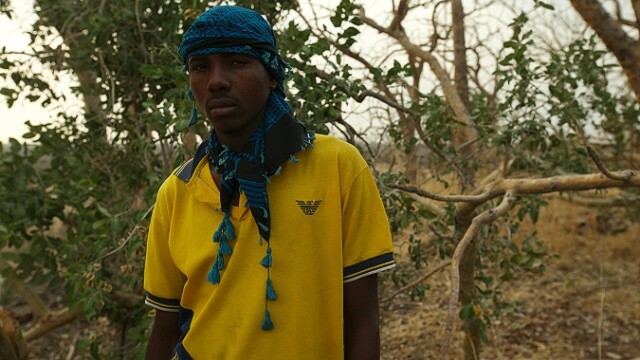 18-year-old Issa Idris visits, for the first time, the site where his father was killed by Sudanese poachers. 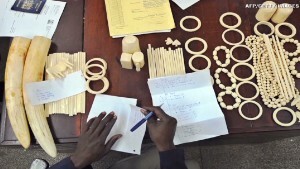 Evidence recovered from the poacher's camp shows links to the Sudanese military. 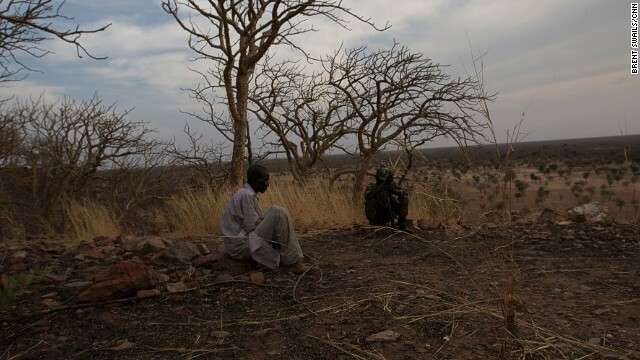 Djimet Seid returns to the spot where six of his fellow African Parks employees were gunned down by Sudanese poachers. 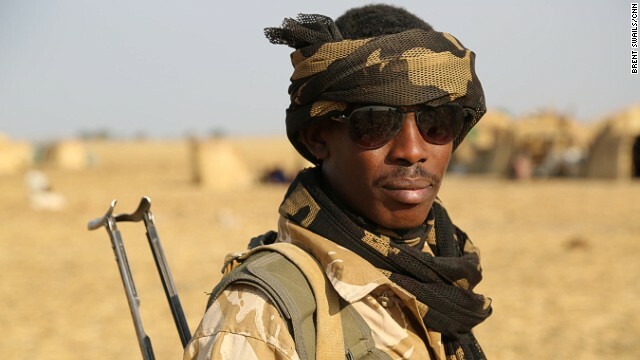 Djimet Seid is the lone survivor of the Heban attack, the site where six rangers were killed by poachers. He and others had emerged for morning prayers when they were ambushed. The poachers fired from three separate locations. Seid was wounded, but escaped by jumping off the side of a cliff and waiting until nightfall to seek help. 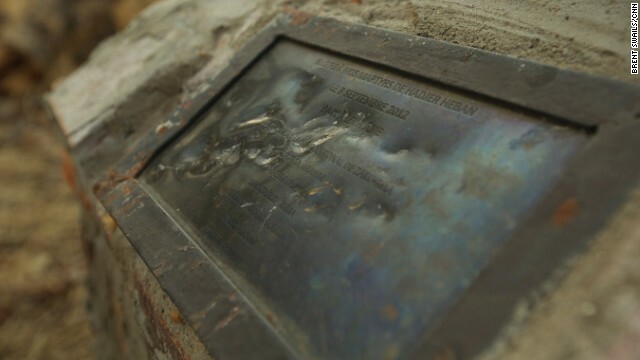 A lone marker in Heban. 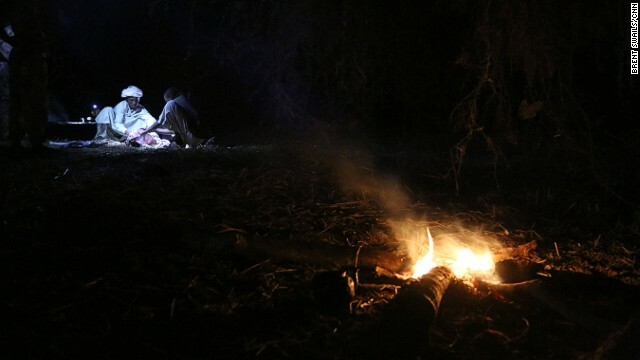 Zakouma's director, Rian Labuschagne, says the assault was revenge for an African Park raid on the poachers camp. The elephants of Zakouma once migrated along the same routes as the area's nomads. This year, the herd has instead descended further into the park's interior, perhaps seeking the relative safety it provides. Editor's note: Wayne Pacelle is president and CEO of the Humane Society of United States, an organization that advocates for animal protection. The opinions expressed in this commentary are solely those of the author. 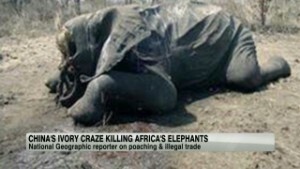 (CNN) -- Poachers threaten to drive the majestic African elephant to the brink of extinction, just as they have the long-persecuted northern white rhino. But poachers aren't the only culprits. Very wealthy hunters, mainly from the United States, are picking off elephants in their zeal to bag the biggest tusks and trophies and rise within the ranks of the global trophy hunting fraternity. There's reason to believe that,as a result of meaningful actions taken by African governments as well as the U.S. government to restrain trophy hunters, this intentional killing may subside. Two African countries, Botswana and Zambia, have just outlawed trophy hunting. And the U.S. 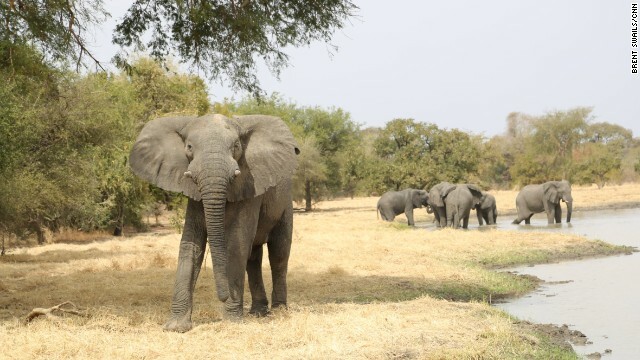 Fish and Wildlife Service has temporarily stopped issuing permits for hunters to bring home their elephant trophies from Tanzania and Zimbabwe, where hunting is legal and poorly regulated. Robert Mugabe, the corrupt strongman of Zimbabwe, has allowed so many natural resources within his country to be looted that it makes perfect sense that he cannot be trusted to provide safeguards for the elephants of his country. 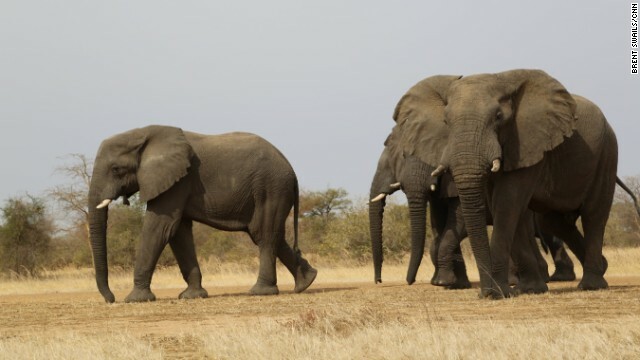 In 2012, the most recent year for which data are available, hunters received permits to import 204 elephant trophies from Zimbabwe and 36 from Tanzania. Another 261 elephants were shot and killed in Botswana. Now, thanks to the U.S. import ban and the hunting prohibitions in the two African nations, 500 elephants are likely to live this year -- since hunters won't kill them if they can't bring back the parts. Unfortunately, hunters can still import trophies from elephants killed in South Africa and Namibia, an inexcusable gap in the regulatory efforts to curb the ivory trade. It's time that all African nations with elephants join Botswana, Kenya and Zambia in barring trophy hunting. Elephants are much more valuable to the economies of African nations alive than dead. An elephant can be watched throughout his lifetime, and there's an enormous and growing pool of ecotourism customers waiting for that thrilling experience. On the other hand, the creature targeted by the hunter dies after a single bullet tears up his insides, meaning the revenue gained is merely a one shot deal. What's more, the pool of people who want to kill elephants for fun is tiny and declining. The pictures and the memories for the ecotourists will last a lifetime, and it's a trip they'll never be ashamed to recount to their grandkids. Safari Club International, the lobbying arm of the trophy-hunting crowd, seeks to rationalize such actions by saying that the money derived from such hunts will help animals on the ground, in part by stimulating the flow of money into local communities in their range states and helping to fund conservation efforts. But that twisted logic -- kill them to save them -- does not fit with 21st century reality. If American trophy hunters were sincere, they could invest their wealth directly to fight illegal killing. Anti-poaching teams on the ground need help because poachers, often associated with terrorist groups, slaughtered an estimated 22,000 African elephants last year to sell trinkets in the global marketplace. That number is unsustainable, and wild elephants are plainly in crisis. "An elephant with really good ivory (100 pounds, or 45 kg, per tusk used to be the magic number, though these days 70 pounds, or 32 kg, is considered very good) is generally considered Africa's top hunting trophy. Trophy quality is determined by the weight and beauty of the tusks." I ask myself: Would a poacher put it any differently? Against tremendous pressure from a small cadre of hunters and others who want to trade in ivory, including the folks at Safari Club International, the United States has taken strong steps against the trade in ivory goods. In February, the Obama administration took aim at poachers by further tightening restrictions on this trade within America's borders. After China, America is the world's largest market for ivory products. The United States and the rest of the world need to do more -- and quickly. At a time when we ask poor Africans to stop killing elephants to trade in ivory trinkets, is it too much to ask rich Americans to stop killing elephants for trade in trophies for display in their homes? Good heavens, isn't this so obvious? Several members of Congress are trying to pressure the U.S. Fish and Wildlife Service to lift its recently imposed import restrictions on elephant trophies from Tanzania and Zimbabwe. The Obama administration should reject this lobbying effort. Crass displays of hunting conquests shouldn't come by depriving our world of one of the grandest creatures to leave its footprints on the savannahs and in the forests of Africa.